MCLEAN, VA--(Marketwired - Oct 13, 2015) - CakeBoxx Technologies, innovator of the safe, secure and efficient CakeBoxx line of door-less intermodal shipping containers, today announced the availability of their new TrusDek™ Series. Like other CakeBoxx containers, TrusDek is a two-part container with a one-piece lid that securely locks to the bottom deck, keeping cargo safe and secure during transport and storage. The TrusDek conveniently loads like a flat-rack or open-top container. It is specifically designed for the carriage of heavy, top- and side-loaded machinery and project cargo shipments that require more deck strength and thickness for the mounting of hardware, plumbing or electrical connections below the surface of the deck. The TrusDek series containers use the new Vertical Locking System comprised of super-tough, easily-operated twist locks. This makes the lid extremely easy to place and remove while providing a very high level of reliability and maintainability. As with all CakeBoxx models, the TrusDek container and lid are handled by all standard container handling equipment and a wide variety of commercial lifting equipment. The use of the Vertical Locking System allows the deck to be configured in two basic variations: a flat, open deck for maximum footprint and a recessed deck model that offers more vertical space while providing an exceptionally secure fit for rolling stock and heavy equipment. As an added capability, the more robust design of the TrusDek's thicker deck also allows it to be used as a pallet after the lid is removed and can be forklifted or slung while fully loaded. All TrusDek models are configured with the versatile Perimeter Tie-down System (PTS™), providing customer-defined lashing points and an option of either steel or plywood flooring. The thickness of the TrusDek deck allows the floor to be customized with countersunk, threaded attachment points for a variety of anchor fittings or through-bolts allowing options to secure cargos in ways that ordinary, doored containers cannot. "The TrusDek™ series was developed in response to the needs of the top and side loaded project cargo market," said Daine Eisold, CEO of CakeBoxx Technologies. "The TrusDek is extremely reliable and easy to operate. 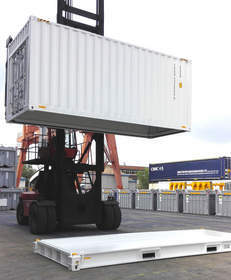 We offer the strength and loading ease of the flat rack or open top design combined with the security of a completely enclosed and secure container. TrusDek will solve of a lot of problems in the project cargo and special applications world where cargo safety and operational efficiency are top priorities," Eisold added. CakeBoxx's TrusDek series containers are available in 20', 40' and 45' lengths, half-height, hi-cube and as both standard dry cargo or insulated (FreshBoxx™) versions. All CakeBoxx TrusDek containers come preconfigured with the Globe Tracker integrated container tracking system. As with all CakeBoxx models, the open-architecture design of the CakeBoxx TrusDek Series provides enhanced safety for the cargo, for cargo handlers and for the Boxx itself. 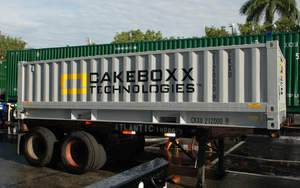 CakeBoxx Technologies designs, markets, and sells the patented CakeBoxx line of cargo shipping containers to the global intermodal transportation market. The company provides a premium quality product line for high-value, high-consequence cargos and for customers who want to ensure maximum safety, security and efficiency from stuffing point to end-user. 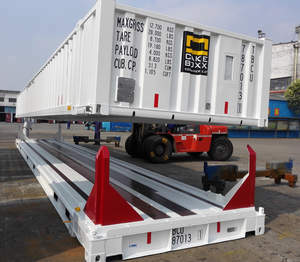 The patented CakeBoxx two-piece (door-less) construction is an innovation in the container industry. See how CakeBoxx revolutionary intermodal cargo shipping containers provide safe, secure and efficient cargo solutions.